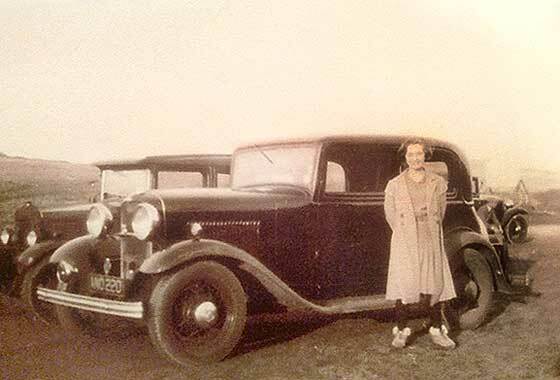 Our regular contributor Mark Dawber (New Zealand) is trying to identify the car on this photo and believes it may be Archibal Clemes in a Wolseley in Canada? -- Research suggests an Archibald Clemes was a businessman from Spences Bridge in British Columbia where he owned hotels. He was one of the first car owners in the area having purchased a Wolseley at the Paris World Exhibition and received it in Canada some 'three years later'. Ties in as it is a cca 1904 Wolseley 6HP Voiturette. Period postcard received from Alan Griffin (UK) he plans to include in a book of old images of Warwickshire. 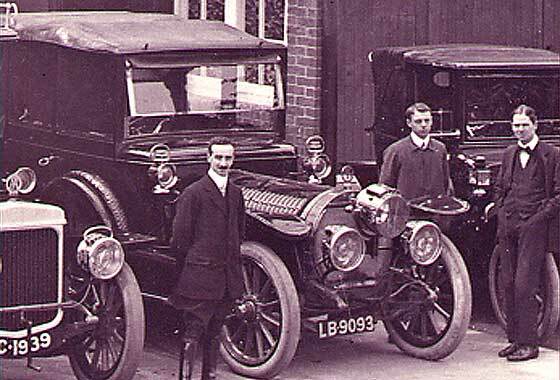 Cars owned by American Charles Tuller Garland who built Moreton Hall in Warwickshire in 1907; son of co-founder of the First National City Bank in New York. -- Very unusual looking vehicle with wide-track chassis and finned narrow bonnet. Perhaps a commercial. Registration only part visible poss London. Looks much like the cca 1908 Lacre 25cwt 16h. Could also be a Thames. Period postcard received from Alan Griffin (UK) he plans to include in a book of old images of Warwickshire. 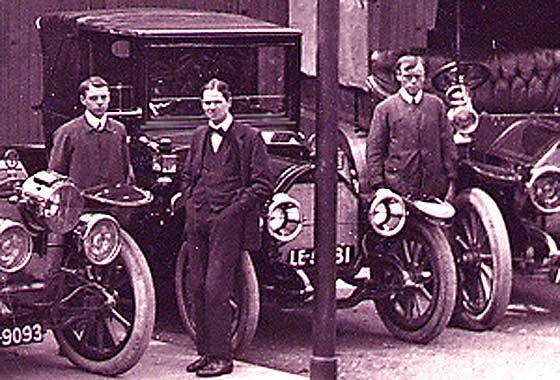 Cars owned by American Charles Tuller Garland who built Moreton Hall in Warwickshire in 1907; son of co-founder of the First National City Bank in New York. -- Another rather difficult one to make out. Numberplate is A2761 of 1904 London. This would tie in with being a big cca 1903/4 Mercedes rebuilt as utility vehicle. 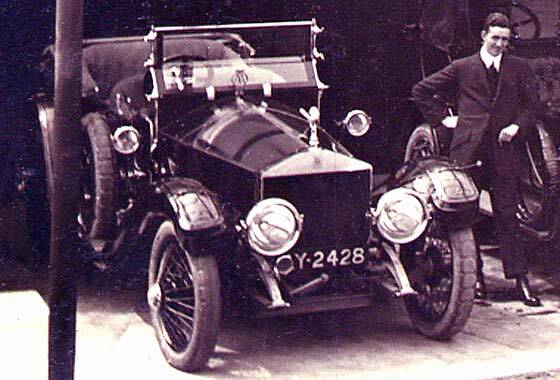 Alternative is that it might have been cca 1908 FIAT Surrey. Period postcard received from Alan Griffin (UK) he plans to include in a book of old images of Warwickshire. 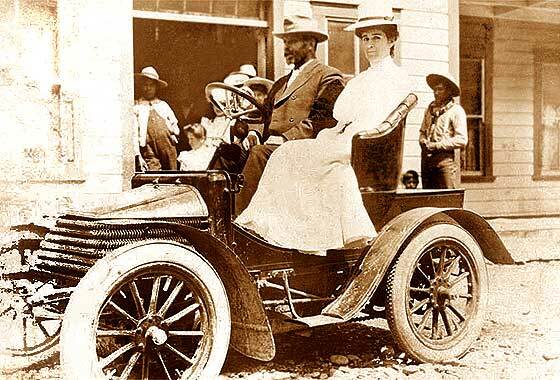 Cars owned by American Charles Tuller Garland who built Moreton Hall in Warwickshire in 1907; son of co-founder of the First National City Bank in New York. -- Difficult to make out features but two experts feel this is another German Benz. Reg'n is LE 5##1, which is London CC early 1912. Another thought is an American cca 1911 Mitchell Two-seater with European coachwork. IDENTIFICATION AND DATING: 1909 Hotchkiss 30CV Limousine D.
Period postcard received from Alan Griffin (UK) he plans to include in a book of old images of Warwickshire. Cars owned by American Charles Tuller Garland who built Moreton Hall in Warwickshire in 1907; son of co-founder of the First National City Bank in New York. 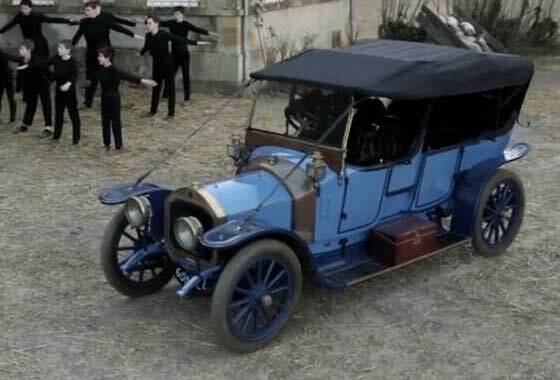 -- Interesting French car built near Paris by a manufacturer of armaments and early automobile components; own first car in 1903. Registration is London and the car is cca 1909 Hotchkiss Model X 30CV Limousine Demontable. Period postcard received from Alan Griffin (UK) he plans to include in a book of old images of Warwickshire. 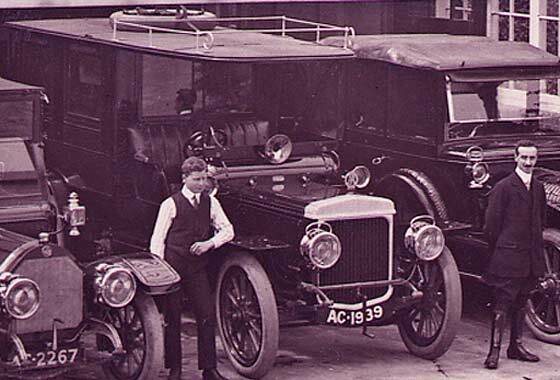 Cars owned by American Charles Tuller Garland who built Moreton Hall in Warwickshire in 1907; son of co-founder of the First National City Bank in New York. -- Car is British by oldest UK car maker, who had the Royal Warrant in 1902 issued by King Edward VII. Reg'n is Warwick CC 1910 and from the number of wheel spokes would seem to be cca 1910 Daimler 22HP Limousine. Period postcard received from Alan Griffin (UK) he plans to include in a book of old images of Warwickshire. 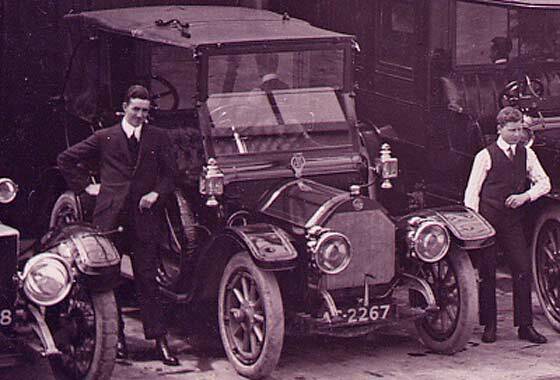 Cars owned by American Charles Tuller Garland who built Moreton Hall in Warwickshire in 1907; son of co-founder of the First National City Bank in New York. -- Couple of our experts agree car is probably German built in Mannheim by world's first car maker started 1885. This one would seem to have been registered Warwick CC 1909 so would be cca 1909 Benz 45'60 Open Landaulette. Period postcard received from Alan Griffin (UK) he plans to include in a book of old images of Warwickshire. 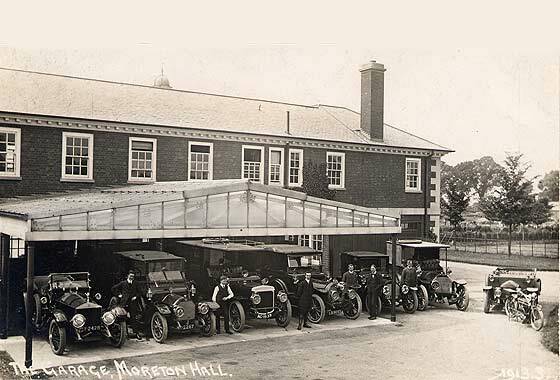 Cars owned by American Charles Tuller Garland who built Moreton Hall in Warwickshire in 1907; son of co-founder of the First National City Bank in New York. -- Car is British, one of the best known, but Royal Warrant only in 1950. Confirmed by Tom Clarke it is a cca 1912 Rolls Royce Silver Ghost, chassis no.2167, reg'n AY2428, Holmes of Derby tourer, London to Edinburgh chassis. Cinema screen grab taken from a French film "La révolte des innocents" (The revolt of the innocent) made in 2018, where cars are investigated by IMCDB. Film is about a young boy placed in a school which turns out a place of mistreatment. -- Car from 1899 French firm in Paris which made name 1905 by making taxis. From light dumbirons, no scuttle and upturned rear wings this car would seem to be Renault's best seller pre WW1, cca 1910 Renault AX 8CV, Three-Seater, having a rear dickey. 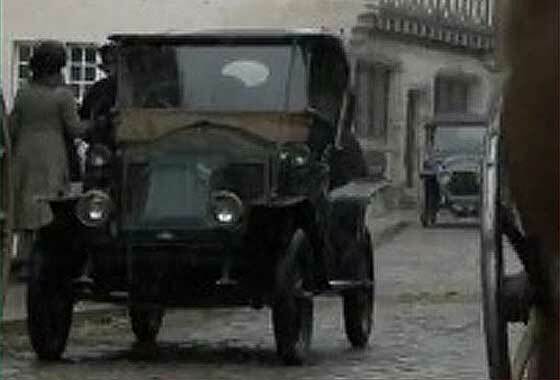 Cinema screen grab taken from a French film "La révolte des innocents" (The revolt of the innocent) made in 2018, where cars are investigated by IMCDB. Film is about a young boy placed in a school which turns out to be a place of mistreatment. -- The car is French, from a company that started in 1900 near Paris making quadricycles. 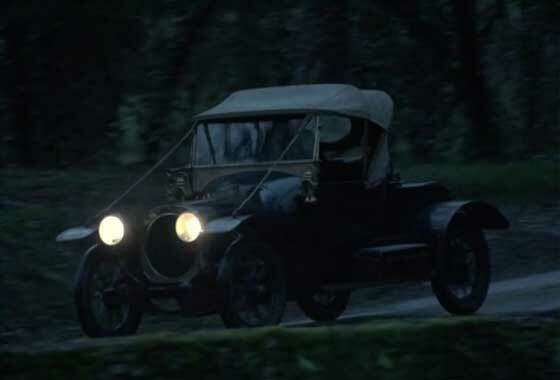 This particular car seems to heve been used in other films and seems to be a cca 1912 Chenard Walcker Model TT Two-seater Cabriolet of 10 HP. Ended 1950. Cinema screen grab taken from a French film "La révolte des innocents" (The revolt of the innocent) made in 2018, where cars are investigated by IMCDB. Film is about a young boy placed in a school which turns out to be a place of mistreatment. -- The car is French, a follow-on to the Georges Richard Company of 1905. This one has the flat front radiator, has the unusual brass scuttle fuel tank and coachwork type which dates it as cca 1912/3 Unic Double Phaeton Torpedo, 12HP. Trucks to 1966. Our regular contributor Mark Dawber (New Zealand) is trying to identify the motorcycle on a photo from Facebook - both from Masterton (north of Wellington). 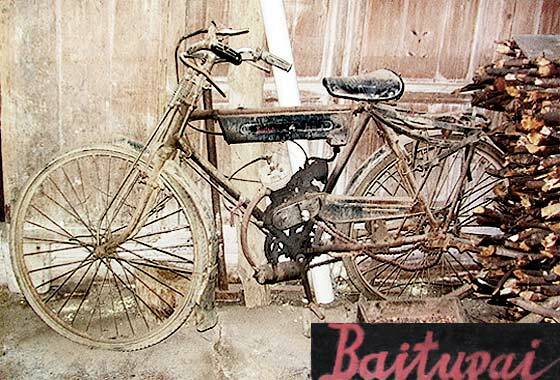 It says Clyno but specifically which model?-- Clyno made cars from 1922 but up to then made motorcycles from 1909. 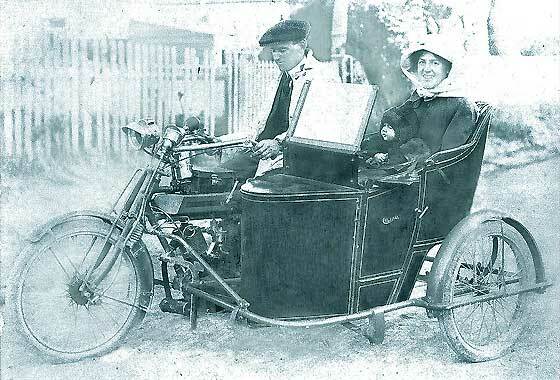 This is a cca 1913 Clyno 750cc V Twin Sidecar Outfit with Clyno's own Standard Side-Car which cost £17 extra. Solo motorcycle cost 65 Guineas (£68.5.0) with a gearbox option, two to four gears, at 10 Guineas extra. One of number of interesting photos sent to us by Andrew Kostin from Moscow (Russia), who is a collector of old photos. 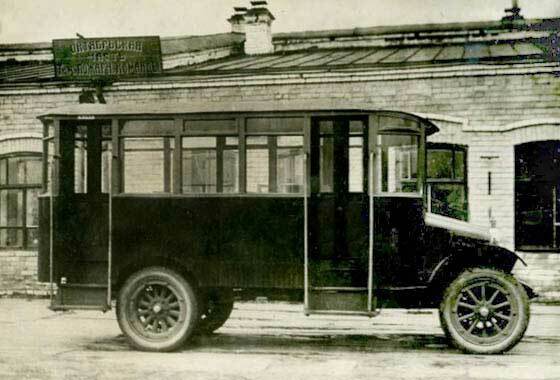 Can we identify this vehicle on a photo from beginning of 1920s that belong to a fellow collector from Russia. -- Relatively small photo that does not enlarge well because of the original low definition. From the unusual sloping bonnet this is perhaps American, a cca 1914 Denby 1 or 2 Ton Truck Chassis with a local Bus Body. Denby were based in Detroit 1914-1930. 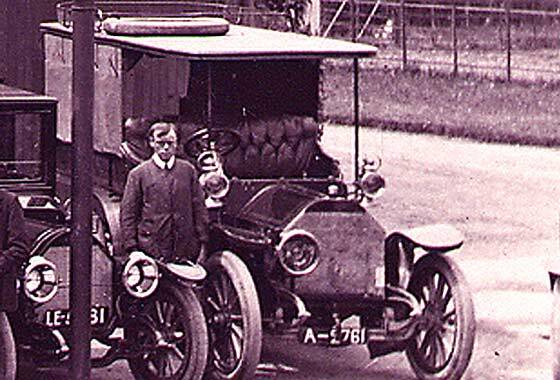 Another interesting period photo received from Scott Wesson (USA) hoping we can help identify this c1918 car. Great aunt was involved in travelling shows between 1915 - 20. -- Couple of interesting features: rounded profile to front of the radiator, and running board going up the curve of mudguards front & back, especially the wide section at front. With assistance of Mark Dawber and our friends at AACA we think this is a cca 1917 Marmon 34 Cloverleaf Roadster, but is on wooden wheels. Interesting miniscule photo sent to us by George Layton from (Italy) asking us if we would have a go at analysing it. -- The photo is about the size of a postage stamp, about 150 x 120 pixels at 72 dpi; neigh on impossible to make out details to identify it positively. We have enlarged and sharpened the photo. The numberplate and wing mounted sidelights suggest UK. 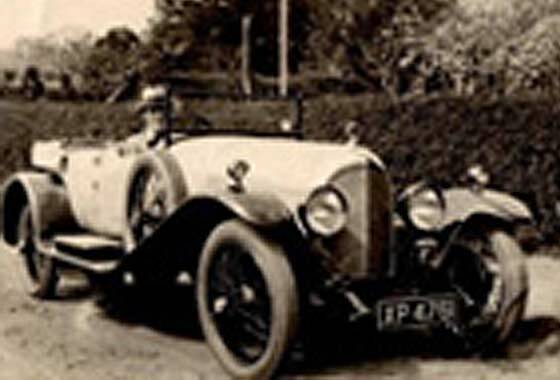 Number of European sportscars had pointed rads but as photographed in UK probably a cca 1921 Bentley 3 Litre Sports. 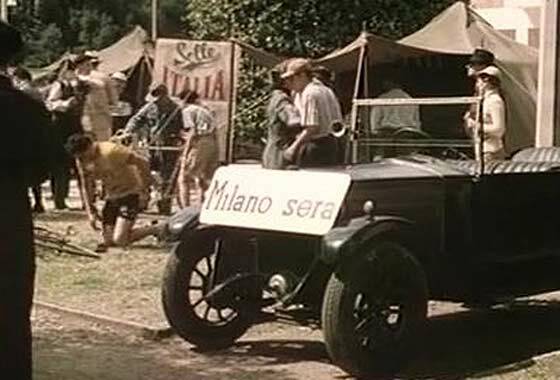 Our regular contributor Mark Dawber (New Zealand) is trying to identify the car on screen grab from Swedish mini series 'Petter Kommer Iigen' (Petter will come again) made in 1963/4 where the cars are being investigated by IMCDB. Being questioned if the car was a Citroen or an Opel. -- The Opel Laubfrosch was introduced in 1924 and was very similar car to the Citroen Type C introduced in 1922. Roof starts half way over the boot so it is cca 1923 Citroen 5CV Trefle C3 three seater. Cinema screen grab from an Italian film " Il Grande Fausto " (The Great Fausto) made in 1995, where cars are investigated by IMCDB. Film is about Fausto Coppi, Italian cycling champion who won the Giro d'Italia and Tour of France in same year. -- Interesting photo as the placard completely blanks out the front of the car, except for the shiny blob of the externally mounted generator below the radiator. Car also has the additional bonnet body swage line. This is cca 1927 Fiat 509A Torpedo. 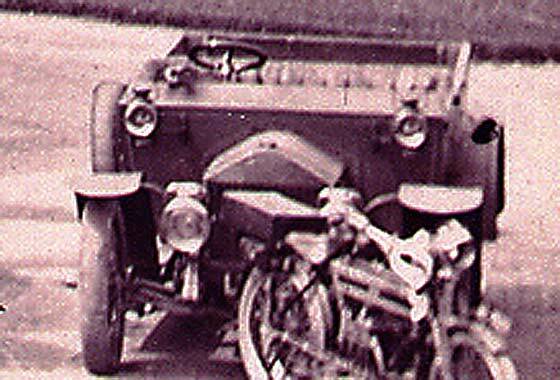 Interesting period photo received from Scott Wesson (USA) hoping we can help identify this roadster c1929. 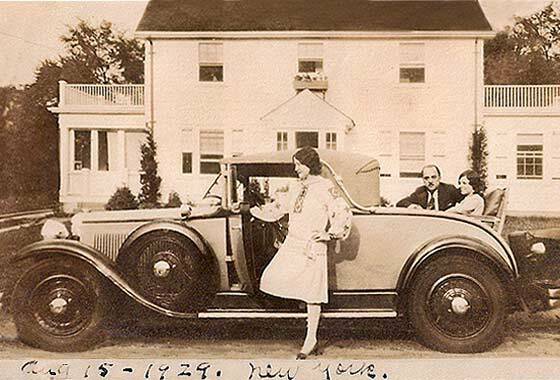 The car was being driven in Washington, DC and New York in 1929 and 1930. So far unable to establish the make and model. -- Agreement from our Mark Dawber that this is an American Nash. This car is from the top end of the price scale, a top line cca 1929 Nash Advanced Six Model 461 Cabriolet. The first year for twin ignition and the last year before the line of new eight. Another very interesting period photo received from Christine Roach (UK) this one from her father's files. 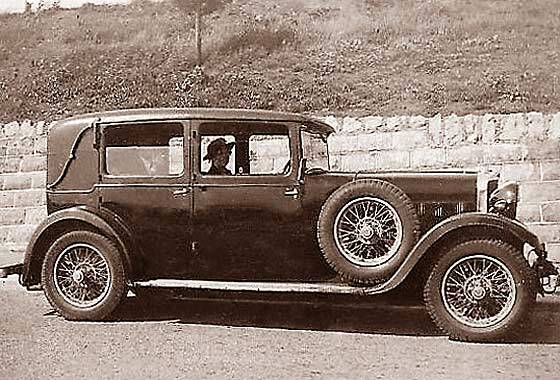 He has described it as a 1930 Roesch Talbot 75 Mulliner Body. -- Talbot was then part of the Sunbeam Talbot Darracq group, and Swiss-born Chief Engineer Georges Roesch developed this car from the previous 14'45 model. Initially called the 70, it became the 75 by virtue of its speed. It was fitted with a 2276cc six cylinder engine and two sizes of chassis. Various bodies available. Interesting period photo received from Bob Knowles (UK) of his mother as a girl (about 14) standing next to his Grandfather's car c1933/4/5. Family stories suggest he drove an American car, possibly a Ford. 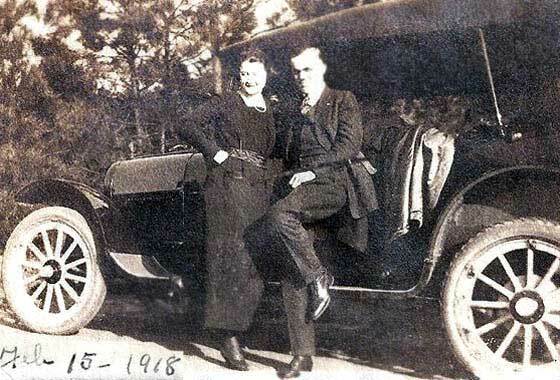 -- Vehicle of choice of Bonnie Parker and Clyde Barrow (Bonnie & Clyde! ), Clyde even wrote congratulations to Henry Ford. This is indeed an American Car but with RHD and British side lights. Also quite an unusual body being a cca 1932 Ford Model B Tudor Victoria V8. Popular Hotrod! One of number of interesting photos sent to us by Andrew Kostin from Moscow (Russia), a collector of old photos. 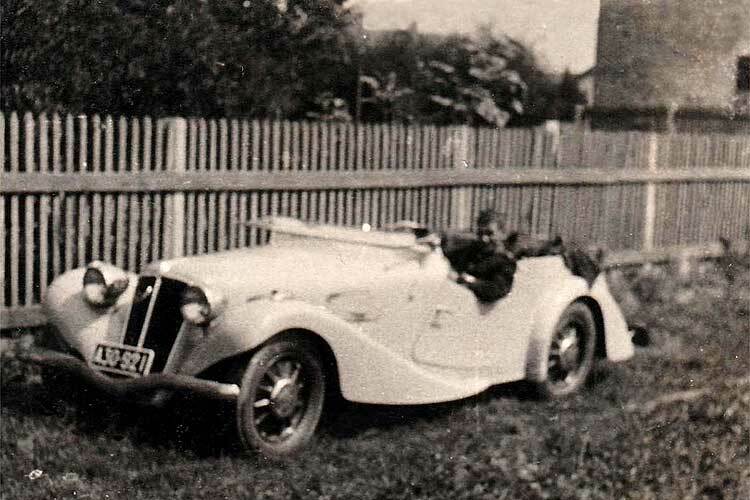 Can we identify this vehicle taken somewhere in Poland in the interwar period? -- Nice sporting lines on a car made in central European country with established tradition of good cars. This was made in Prague Czechoslovakia by company which also made aircraft, hence the name; cca1934 Aero 30 Sports with front wheel drive and a 998 cc twin engine. 7,800 off made. One of number of interesting photos sent to us by Andrew Kostin from Moscow (Russia), a collector of old photos. 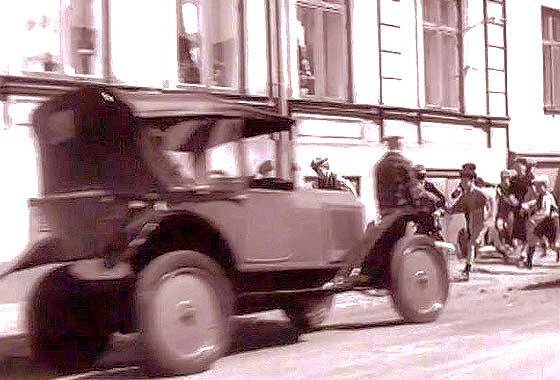 Can we identify this vehicle taken somewhere in Poland in the interwar period? -- Relatively unusual car made in Hanover, Germany, by a company who started making steam locomotives 1846. First car in 1925. 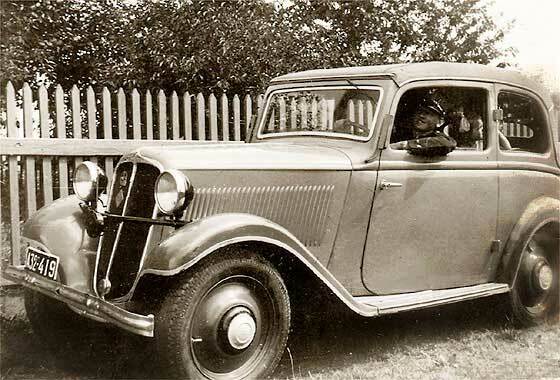 From position of the door hinges, unusual roof, and having wheel hubs, this is a cca 1936 Hanomag Garant Cabriolimousine with a body by Karosserie Karmann. Fascinating photo sent to us by our veterans owning member David Smart (UK) of a machine he photographed a few years ago while on a visit to the backwaters of China. What can we tell him about it? -- Not a lot. The name on the tank is Baitupai. We have not been able to trace any details on the company but the principle is stil current of a 'petrol powered bicycle engine' that is designed to bolt onto any bicycle and drive rear wheel by an additional sprocket. Translates 'White Rabbit" ? Enquiry and photo received from Fernando Murillo saying: Please try to identify this car. I'll be forever grateful. Thanks! -- Familiar Japanese shape car to us oldies who might have had them new. However did need help from senior son to nail down the model. 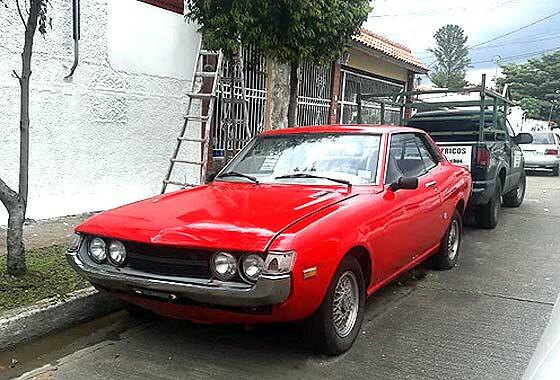 This is a cca 1973 Toyota Celica Coupe (Latin Heavenly). Dating is from rear window and angle of front sidelight which signify the 1st generation. There were numerous trim levels and some engine levels dependant on country where it sold. 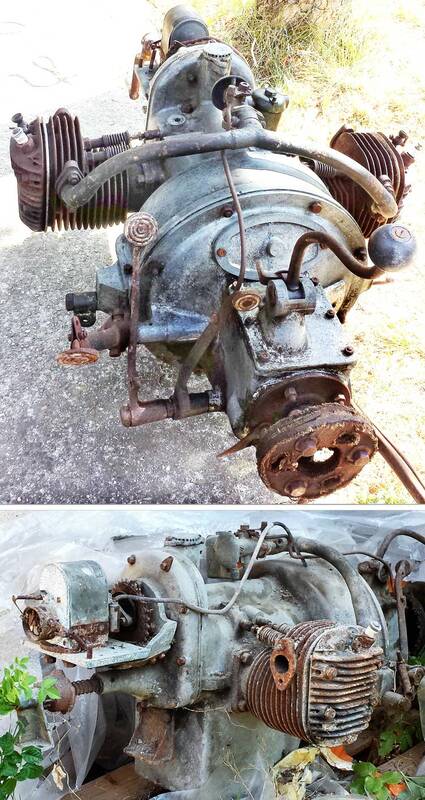 Fascinating photo received from (France) of a side-valve, air-cooled flat-twin engine/gearbox found near Lyon. No marks, but has Ericsson magneto, Solex carb and Marchal plugs. Gearbox is a two speed + reverse. Perhaps cyclecar from 20/30s? -- Regret this is a bit too specialised for us in the UK as the unit does seem to have a French feel. Not a stationary engine as has clutch/brake pedals. Ericsson mags made in Paris and Buffalo USA! Any HELP would be much appreciated!